Summer 2017 started Tuesday July 4th and ran until Friday August 18th. This summer consisted of forty enthusiastic tennis instructors and three highly qualified supervisors, servicing nineteen sites and welcoming over 9,000 campers into the program. It truly was another outstanding Philpott season! Every morning for seven weeks we provided free tennis lessons at the following sites: Amesbury Community Recreation Centre (CRC), Antibes Community Centre (CC), Cabbagetown Youth Centre, Chalkfarm CC, Dovercourt Boys & Girls Club, Flemingdon Park CC, Grandravine CC, Jimmie Simpson CRC, Kingsview Village CC, Lawrence Heights CC, Malvern CRC, McGregor Park CRC, Parkdale CRC, Oakridge CRC, San Romanoway, Secord CC, Silver Creek Park, L’Amoreaux CC and Joseph J Piccininni CC. 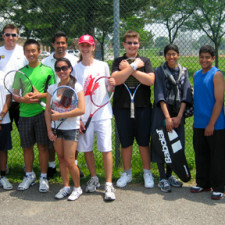 Due to the demand, an eighth week was added at Secord CC, Antibes CC, Silver Creek Park, L’Amoreaux CC and McGregor CC. This year we added a former Philpott camper, volunteer, participant in our leadership/Tennis Canada certification program and tennis coach as a Volunteer Coordinator. As a Philpott youth ambassador he visited sites speaking to the volunteers and youth, presenting a pathway to them that would include volunteer hours, winter lessons at L’Amoreaux and possible Tennis Canada certification that could lead to employment as a Philpott tennis coach. Teaming up with Greenwin Inc. and the Believe to Achieve Organization, and funding from the Charles Johnson Charitable Fund, this summer we provided tennis programming for at-risk youth in the Chalkfarm community. The Chalkfarm initiative is modelled after Philpott’s summer camp at San Romanoway (Jane Finch neighbourhood) and was very successful in providing a safe and fun alternative for the Chalkfarm children. For the third year, The Boulevard Club in partnership with the Doug Philpott Inner City Children’s Tennis Fund will be providing the Parkdale community an indoor tennis program this fall and winter at no cost to the participants, starting Nov 11 and running until March 10, 2018. Since the inception of this program 50 children have been able to participate in winter tennis lessons at the Boulevard Club. The children and their parents who took part in this unique opportunity were quick to express their gratitude. 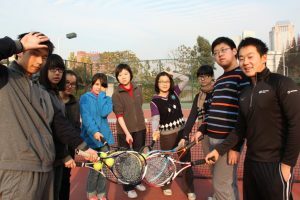 Their children were receiving free tennis lessons from highly trained instructors at a first class tennis facility in the middle of the winter! As noted this summer by the Philpott instructors teaching the Philpott campers at the Parkdale site, the children who took part in the winter lessons provided by the Boulevard Club are truly becoming tennis players. Once again talks are underway with the City of Toronto and the Scarborough Winter Tennis Club requesting indoor court time for the Philpott campers from the L’Amoreaux Community Centre. We are also asking for court time to train our youth volunteers so they are Tennis Canada certification ready by the March break. This winter the North York Winter Tennis Club (NYWTC) is offering the Philpott organization two hours of free court time on two courts every second Saturday evening from 5:30 to 7:30 pm, starting October 7 and running until April 7, 2018. Children ages 6 to 12 from the Philpott communities will have the opportunity to take the free lessons. There will be volunteer opportunities for youth ages 13 to 15. We are thankful for the support of the Toronto tennis community, individual donors and Toronto’s largest private tennis clubs, namely The Boulevard Club, The Cricket Club, The Granite Club, The Toronto Badminton and Racquet Club and The Toronto Lawn Tennis Club. This year our major financial partners include Tennis Canada, Canadian Tire Jumpstart Charities, the Philpott Ladies Invitational (hosted by The Boulevard Club in 2017), the Tennis-A-Thon tournaments, the Men’s Doubles tournament captained by Daniel Nestor and Casey Curtis, Trinity College Tennis Club, Leaside Tennis Club, Davisville Tennis Club, the Toronto Lawn Tennis Club, the CIBC Children’s Miracle, the Charles Johnson Charitable Fund, the Gooder Foundation, and the Daniel Nestor Foundation. We are always extremely grateful to Head Canada, Wilson Sport, RacquetGuys and The Merchant of Tennis. Once again the Racquet Donation Program was a tremendous success and with the support of Toronto tennis players, we gave away over 500 racquets. Thank you for all you do to make this most significant program happen for the children of Toronto living in priority needs neighbourhoods. Your support truly makes a difference!